The 2019 BMW X7 has finally made its debut and its quite big, and I'm not talking about the grille. Parked next to the X5, the X7 is nine inches longer, making it the longest crossover BMW has sold. For the most part, BMW's designers didn't go too crazy with the design. The overall profile is similar to Mercedes' GLS-Class with a boxy profile and large glass area. One interesting trait is the rear doors being slightly longer than the front to allow for easier access into the second and third rows. Where designers decided to go nuts is the front end and its large kidney grilles. It's a bit much when contrasted with the slim LED headlights. The X7's interior looks to be quite plush and spacious. A new dashboard design features a minimal amount of buttons and twin 12.3-inch screens for the instruments and the infotainment. A second-row bench comes standard, which allows the X7 to carry up to seven people. An optional set of captain chairs for the second-row have power adjustments. Cargo space is quite healthy for the class with 48.6 cubic feet behind the third row and 90.4 cubic feet with both rows folded. Power for the U.S. will be provided by either the xDrive40i (turbocharged 3.0L inline-six; 335 horsepower and 330 pound-feet of torque) or the xDrive50i (twin-turbo 4.4L V8; 456 horsepower and 479 pound-feet of torque). Both engines come teamed with an eight-speed automatic and xDrive all-wheel drive. Optional on both powertains is either Dynamic Handling Package (active roll mitigation, a camera system that can firm up the suspension before a corner, rear-wheel steering) or Off-Road package. BMW will begin taking preorders for the X7 this month, with deliveries beginning in March. Pricing begins at $73,900 for the xDrive40i and $92,600 for the xDrive50i - prices don't include destination. Three rows of seating for 7 passenger comfort. Pricing: $73,900 for X7 xDrive40i and $92,600 for X7 xDrive50i plus $995 Destination.For the first time, it will be possible to pre-order a brand new BMW vehicle online. The New BMW X7 arrives in March 2019. Woodcliff Lake, NJ – October 16, 2018…Today, BMW launches the first-ever BMW X7, the pinnacle of BMW’s X Sport Activity Vehicle lineup. The BMW X7 builds on the class leading comfort, handling, safety and technology of all the previous BMW X Sport Activity Vehicle model lines that have been produced at Plant Spartanburg since 1999. The 2019 BMW X7 offers standard three row seating for 7 with optional Second-row Captain’s Chairs offering a more exclusive seating arrangement for 6. Standard two-axle air suspension, 21-inch alloy wheels and advanced driver assistance systems ensure that the new BMW X7 lives up to expectations of style, driver engagement, passenger comfort and all-weather and all-terrain capability. For the first time, BMW customers will have the opportunity to pre-order the first-ever BMW X7 online through www.BMWUSA.com. Starting in mid-Oct. 2018, customers will be able to select a participating dealer of choice and complete their pre-order deposit transaction online via their mobile device or from the comfort of their home. Their selected dealer will then reach out to them to finalize the options and colors of their BMW X7. Customers who pre-order online will also enjoy priority vehicle production. The new 2019 X7 becomes the fifth BMW model to be currently produced in Plant Spartanburg, South Carolina. The new X7 will be added to the 1,400 vehicles, including the X3, X4, X5 and X6, which are already produced every day at BMW Group’s largest global production plant. In 2017, the 10,000 employees of Plant Spartanburg produced 371,284 vehicles, 70 percent of which (272,346), were exported to 140 countries around the world, making BMW the largest exporter of vehicles from the U.S by value. To date, the BMW Group has invested eight billion US dollars in Plant Spartanburg and is supported by 40 suppliers in the SC area and 300 suppliers across the U.S. The current manufacturing capacity stands at 450,000 vehicles and a further 1,000 new jobs are expected to be added by 2021. Since the plant opened on September 8, 1994, 3.9 million vehicles have been built at the South Carolina location. BMW has pulled back the covers on a new definition of automotive luxury. The BMW X7 blends presence, exclusivity and spaciousness with the versatile and agile driving properties customers would expect from a BMW Sports Activity Vehicle (SAV). The newest and largest model in the BMW X line-up uses outstanding powertrain options and chassis technology, plus generous levels of space in each of its three rows of seats, a luxurious ambience and advanced equipment features, to deliver unparalleled experiences for the driver and passengers. 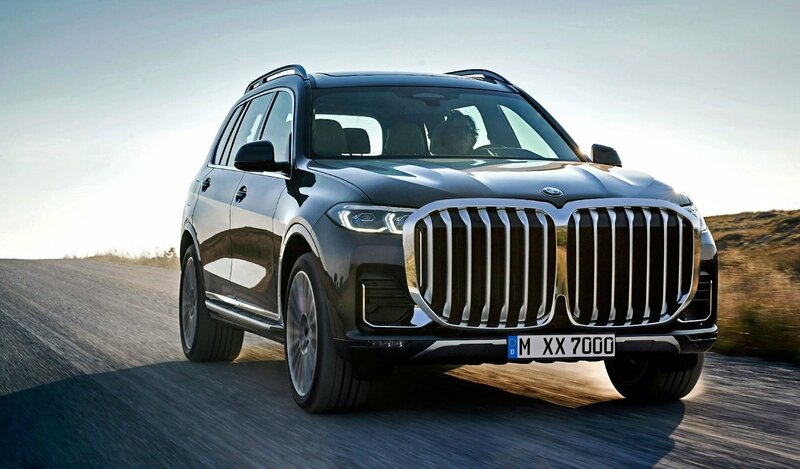 BMW’s new design language brings the modern elegance characteristic of the brand’s luxury-segment models to the exterior of the BMW X7, and adds visual poise, assurance and an overriding sense of authority. The BMW X7 represents the next stage in the premium carmaker’s ongoing model offensive in the luxury segment. The expansive exterior dimensions of the BMW X7 take luxury to a new level. At 203.3 inches in length, 78.7 inches wide and 71.1 inches tall, and with a wheelbase of 122.2 inches, the X7 displays harmonious proportions and establishes itself as the new head of the BMW X model family. A new use of forms, dominated by clearly structured surfaces and precise lines, lends the BMW X7 its modern aura. The largest kidney grill ever designed for a BMW model features very prominently at the front of the new BMW X7. Together with the slim twin headlights extending up to the grill, it emphasizes the width of the car and creates presence. When viewed from the side, the large windows and long, flowing roofline of the new BMW X7 hint at a spacious interior bathed in light. The rear doors are longer than the front doors, emphasizing the spaciousness of the SAV’s rear compartment and easing entry and exit for second and third row seat occupants. Clearly structured surfaces and the eye-catching character line rising up to the rear are hallmarks of the brand’s new design language. The versatile functionality of the new BMW X7 is highlighted by its 8.7 inches of ground clearance. The sizeable dimensions of the new BMW X7 are also expressed at the rear, which is broken up by horizontal lines and bordered by vertical separating edges. The slim LED rear lights provide a clear segmentation of the rear. Bridging the space between the two units is a chrome bar – a design cue only previously encountered at the rear of the BMW 7 Series luxury sedan. The impressive open expanse of the BMW X7 interior brings a new sensation of space to the luxury segment. The three rows of seats treat the driver and passengers to an exceptional feeling of roominess within the X7’s elegantly appointed interior surroundings. Expansive surfaces and clean structures give the instrument panel a modern look and its lines flow smoothly into the door panels. Large trim surfaces framed with electroplated accents on the instrument panel and center console enhance the interior’s elegant and exclusive aura. Grouped together clearly in the center console are the iDrive Controller, newly designed gear selector, the start/stop button, the Driving Experience Control switches, electronic parking brake switch and controls governing the settings for the air suspension and optional off-road modes. The control panel for the standard 4-zone climate control system also has a new modern design. A standard three-panel electronically controlled panoramic glass sunroof floods the interior with light. Combined with the large windows, the new BMW X7 offers a very open an airy environment to all vehicle occupants, irrespective of which seat they are in. Electrically controlled sliding headliner shades are standard for the front, center and rear sunroof with the third row passengers having their own controls for the rear sliding shade. The roominess and versatility of the interior is underlined by the standard fitment of three rows of seats (offering space for seven people). The two passengers in the third row can settle into full-size seats that are fully capable of accommodating adult passengers over longer journeys. Comfort levels here are enhanced by an additional rear glass sunroof panel, cup holders and armrests integrated into the side panel trim. The standard second row configuration offers seating for three. Alternatively, two extremely comfortable individual Captain’s Chairs can be specified for the middle row as an option. These comfort seats offer the same range of adjustments as the seats for the driver and front passenger. The individual seats for the second row also feature integrated armrests and comfort cushions. Two second-row seats with a space between them represent a first for a BMW SAV and create an exceptionally luxurious ambience in the rear compartment. The space between the individual seats also provides an access route to the third row. In either standard or optional configuration, the second-row seats in the X7 slide fore and aft through 5.7 inches of travel. Adjustment of the fore/aft position – like all other seat positions and backrest angles – is electric for the first, second and third row of seats. The backrests of the seats in the second and third rows can be folded down and raised electrically via switches located on the driver’s side as you enter through the rear doors and in the cargo area. The seats in the second row can also be tilted forward fully to make getting in and out as easy as possible for third-row passengers. The second-row seats can be returned to their upright position at the touch of a button, at which point child seats can be fixed in place securely and easily using the ISOFIX attachments. The fore/aft position of the second-row seats is adjusted using a control panel integrated into the driver’s door. Drivers of the new BMW X7 can move the front-passenger’s seat backwards and forwards at the touch of a button located nearby. This allows the driver to increase both legroom and ease of entry/exit for the passengers in the second and third row of seats as required. Additional buttons for seat and backrest adjustment are located in the rear doors. The backrests of the second - and third-row seats can also be folded down and raised – and the second-row seats moved fore and aft – from the cargo area. When all six/seven seats are in use, the new BMW X7 offers 48.6 cubic feet of load capacity. This increases to a maximum 90.4 cubic feet when the backrests of the standard second row bench seat and third row seats are folded down. The standard air suspension allows the car to be lowered (at the touch of a button in the trunk) to make loading cargo easier. The new BMW X7 features a two-section split tailgate, both elements of which have electric opening and closing as standard. The BMW TwinPower Turbo technology in both gasoline engines features turbocharging, High Precision Injection, VALVETRONIC fully variable valve timing and Double-VANOS variable camshaft timing. Fundamentally upgraded from crankcase to engine management system, the eight-cylinder engine in the BMW X7 xDrive50i serves up an intoxicating blend of power delivery and signature V8 soundtrack. The two turbochargers’ positioning in the “V” between the banks of cylinders is just one of the standout features of the 4.4-liter unit. Newly designed heat plates ensure very effective thermal shielding for the crankcase and cylinder head. A new ignition system allows the engine to be restarted even more smoothly and swiftly when the Auto Start Stop function is activated. The new engine’s peak torque of 479 lb-ft is available over a broad rev range from 1,500 to 4,750 rpm, while its maximum output of 456 hp is on tap between 5,250 and 6,000 rpm. This formidable pulling power is available early and doesn’t let up, resulting in a 0 to 60 mph time of 5.2 seconds. Inline-six cylinder gasoline engine with a thirst for revs. Intelligent connectivity enables the sport automatic transmission to adapt its shift strategy according to the route and driving situation. By working with the navigation system, the 8-speed Steptronic transmission sees the road ahead and combines this data with information from the Active Cruise Control system’s (optional on the X7 xDrive40i) radar sensor. This makes it possible for the transmission to shift proactively instead of reactively insuring not only that the shifts are more seamless but that the X7 is always in the correct gear for the upcoming road conditions. When approaching a vehicle ahead or approaching a downhill section for example, the 8-speed Steptronic transmission will shift down early in order to use engine braking to maintain speed or decelerate. The Auto Start Stop function and the coasting function available in conjunction with the 8-speed Steptronic transmission in the new BMW X7 also benefit from data supplied by the navigation system and by data supplied by the standard Active Guard driving assistance systems’ front camera. In this way, inefficient engine shutdown – for example when stopping briefly at junctions or roundabouts – can be prevented. Movement of vehicles ahead is registered in order to determine the ideal moment for the Auto Start Stop function to stop and start the engine. The coasting function is now available when either ECO Pro or COMFORT mode is selected using the Driving Experience Control switch between 9 and 99 mph. The efficiency-enhancing decoupling of the powertrain only takes place in driving situations where performance and comfort would not be compromised. If the driver suddenly lifts off the accelerator, the powertrain stays connected so that engine braking can be used to support deceleration. For the same reason, powertrain disconnection is also prevented when approaching a junction or a vehicle ahead. The task of maximizing traction, agility and directional stability in the new BMW X7 falls to the latest generation of the BMW xDrive intelligent all-wheel-drive system, which is now able to split drive-torque between the front and rear wheels with even greater precision and speed as the situation demands. For added efficiency, full power can be directed completely to the rear wheels in situations where all-wheel drive traction is not required. The new xDrive system offers a rear-biased set-up for those occasions when the driver adopts a more sporting style of driving. The optional electronically controlled rear M Sport differential (available for the X7 xDrive50i in both the Dynamic Handling Package and in the Off-Road Package) helps support these times of more dynamic driving. By limiting equalization of the rotational speeds of the inside and outside wheels through corners, the M Sport differential is able to optimize the transfer of power to the road in all driving situations. As a result, the new BMW X7 can power out of bends with exceptional momentum. Managed by the Dynamic Stability Control (DSC) system, the locking function for the rear differential also improves traction and power delivery when driving over loose ground or on road surfaces offering differing levels of grip for the left-rear and right-rear wheels. It does so by preventing a wheel from spinning when it is struggling for grip. The locking effect is produced by means of an electric motor and allows as much as 1,106 lb-ft of drive torque to be redirected from the wheel with less grip to the wheel with more grip. The design of the new chassis, based on a double-wishbone front suspension and a five-link rear suspension provides the best balance of exceptional traction on rough terrain and excellent dynamic response and ride comfort on pavement. The BMW X7 SAV comes standard with the Dynamic Damper Control system with two-axle air suspension. The electronically controlled dampers sharpen the SAV’s handling while at the same time increasing ride comfort. The driver can select from two performance settings for a more comfort-oriented or sportier driving style. Chassis options available make it possible to boost the off-road performance, sportiness or comfort of the new BMW X7 more intensely and effectively than ever before. The Dynamic Handling Package, available for both the X7 xDrive40i and X7 xDrive50i, includes Active Comfort Drive with road preview, Integral Active Steering, M Sport Brakes and on the xDrive50i, the M Sport rear Differential. This package affords the new X7 with exceptionally agility and dynamic driving qualities. The Active Comfort Drive with road preview works with the two-axle air suspension and an active roll-stabilization system to not only improve agility and directional stability when turning into corners but to also optimize traction when accelerating out of them too. The system uses camera sensors to preview the road ahead of the vehicle and proactively make suspension adjustments to not only tighten up suspension settings for upcoming turns but to also increase straight-line comfort by actively countering oscillations triggered by road surface imperfections. Speed-dependent Integral Active Steering turns the rear wheels either the same direction as the front, to enhance stability in high-speed maneuvers such as lane changes, or in the opposite direction to the front wheels, to facilitate low-speed maneuvering by decreasing the turning radius. The standard two-axle air suspension system with automatic self-levelling not only provides a noticeable benefit to ride comfort but also allows electronic adjustment of vehicle ride height to meet various needs. The suspension’s air supply is controlled individually for each wheel using an electrically driven compressor with pressure reservoir, enabling it to balance out an unevenly loaded vehicle. Since the air suspension works in tandem with the Dynamic Stability Control (DSC) system, the vehicle load registered by its sensors can be factored into braking calculations. When the SPORT driving mode is engaged or the vehicle’s speed exceeds 85 mph, its ride height is automatically lowered by 0.8 inches. The driver can also adjust the body’s ground clearance – for off-road driving, for example – by pushing a button in the cockpit. The vehicle can be raised in two stages up to a maximum of 1.6 inches above the standard setting. Another button in the luggage compartment activates a loading mode that lowers the vehicle by 1.6 inches. The next time the engine is started, the system will automatically revert to the last mode selected. The desired vehicle ride height can even be set with the engine switched off by using the optional BMW Display Key. The all-new 2019 BMW X7 will offer a choice of six popular existing and brand new colors at launch, including non-metallic Alpine White and metallic paints in Carbon Black with M Sport Package, Black Sapphire, Mineral White, Arctic Grey and Vermont Bronze. Three more colors will be introduced as of April 2019 production, including Jet Black, Dark Graphite, and Phytonic Blue. The X7 xDrive40i comes standard with Black SensaTec or a choice of nine premium Vernasca and Extended Merino Leathers. The X7 xDrive50i features standard Vernasca leather interior in Black, Canberra Beige, Coffee or Cognac with the option to upgrade to an Extended Merino Leather interior in Black, Ivory White, Coffee or Tartufo. A two-tone Ivory White/Navy Blue Full Leather Merino interior, with a Navy Blue leather dashboard and a Navy Blue Alcantara headliner, can be specified for both models. The luxurious interiors can be further enhanced with options such as Leather Dashboard, Glass Controls for the Start/Stop button, Gear Shift lever, iDrive Controller and radio volume knob, Panoramic Sky Lounge LED Roof and Front Ventilated and Massaging Seats. Offering a significantly expanded array of driver assistance systems, the new BMW X7 is able to support the driver through an array of interconnected sensors by processing camera images and data acquired by radar. The BMW X7 xDrive40i comes standard with Active Protection and Active Driving Assistant including Blind Spot Detection, Lane Departure Warning, Rear Collision Warning, Frontal Collision Warning and Pedestrian Warning with City Collision Mitigation (which now also alerts the driver if cyclists are detected) Cross Traffic Alert Rear, and Speed Limit Information. The BMW X7 xDrive50i adds standard Parking Assistant Plus which provides Top View, Panorama View and 3D View. The xDrive50i also includes Head-Up Display and Active Driving Assistant Professional with Active Lane Keeping Assistant and Extended Traffic Jam Assistant for limited access highways. Standard on the X7 xDr50i and optional on the X7 xDrive40i, the Driving Assistant Professional package is comprised of the Extended Traffic Jam Assist for limited access highways as well as the Lane Keeping Assistant with Active Side-Collision protection. Extended Traffic Jam Assist supports the driver during one of the most tedious driving situations, stop-and-go highway traffic. The system can be used on limited access highways up to a speed of 37 mph and uses a driver-facing optical/infrared camera located in the digital instrument cluster to monitor the driver’s eye and nose position to determine if they are monitoring the road ahead. As long as the driver is found to be attentive to the road ahead, the need for the driver to place their hands on the wheel every 30-50 seconds is not required. This interior camera is also used to support the standard driver alertness monitoring system which suggests that one stop and take a relaxing break if it deems that the driver is becoming tired and less alert. The Automatic Lane Change feature can be used on highways when the Lane Keeping Assistant is active. Holding the direction indicator in the required direction is all it takes to initiate a lane change. If the sensors detect that there is space in the adjacent lane and that no other vehicle is approaching at high speed, the driver benefits from helpful steering assistance during the lane change. Another component of the system is the Evasion Aid, which can help avoid collisions with vehicles or pedestrians that appear suddenly in the vehicle’s path. As soon as an evasive maneuver corresponding to such a scenario is detected, the system assists the driver with steering inputs to direct the vehicle into a clear adjacent lane. The array of assistance systems contained in this wide-ranging suite of safety and comfort features is composed of the Active Cruise Control (ACC) with Stop & Go and Cross Traffic Alert Front which reduces the risk of a collision when maneuvering forwards towards crossing traffic where visibility is restricted. Also, changing speed limits identified by the Speed Limit Info system can be used by the Automatic Cruise Control system to match the vehicle’s cruise control speed to the road’s posted speed limit. A new development in the field of safety systems is the Emergency Stop Assistant, which is a component of the optional Driving Assistant Professional package. Intended to be used in situations where the driver is suddenly incapacitated because of a medical emergency, it is activated by pulling the electric parking brake switch. Depending on the driving situation and the vehicle’s surroundings, the Emergency Stop Assistant will bring the vehicle to a standstill either in the current lane, at the edge of the road or on the hard shoulder. At the same time, the hazard warning lights are activated and the Intelligent Emergency Call function automatically notifies the BMW Assist call center so the emergency services can be alerted. The new BMW X7 is equipped with standard rear-view camera and Park Distance Control (PDC), which includes sensors at the front and rear of the vehicle. The Parking Assistant Professional package, standard in the X7 xDrive50i, and optional in the X7 xDrive40i, enables automatic selection and use of parallel parking spaces. These parking spaces are detected by ultrasonic sensors as the vehicle passes them. The Parking Assistant function is activated at the touch of a button on the center console. The system then takes care of the acceleration, braking, steering and gear changes necessary to maneuver into the space. Back-Up Assistant offers an unmatched level of assistance when leaving a parking space or maneuvering in a confined area. The Back-Up Assistant takes over steering to maneuver the vehicle mirroring the path most recently used in the forward direction. This system makes reversing for a distance of up to 50 yards an effortless task in the new 2019 BMW X7. All the driver has to do is operate the accelerator and brakes and monitor the surrounding area. The system is initiated by pressing a button when the vehicle is stationary and the gear selector is in the “P” position. The steering movements made during the vehicle’s last forward maneuver are stored by the system and retained. This means the Back-Up Assistant can be used to maneuver the new BMW X7 backwards out of a parking position that it drove into forwards the previous day. The driver enjoys ideal all-round visibility, thanks to both the standard rear-view camera and the optional Top View, Panorama View and 3D View which are part of Parking Assistant Plus, which create a 360-degree image of the vehicle and its surroundings in the Center Display. In addition, drivers can use the Remote 3D View feature, part of the BMW ConnectedDrive App, to access a three-dimensional live image of their vehicle and surroundings on a smartphone no matter where they are at that moment. The BMW Live Cockpit Professional, standard in the new 2019 BMW X7, combines a new display and control concept and the ultimate in connectivity to create a superb all-round package. The latest-generation of the iDrive comprises a high-resolution digital 12.3” instrument cluster display behind the steering wheel and a 12.3” center display diagonally across. The system offers many hardware upgrades including new haptic controls on the iDrive controller, an advanced tablet-like touch interface, stunning visualizations, and the largest displays available in a BMW. This latest system perfectly blends the strengths of previous iDrive concepts with the modern ways in which people interface with their popular electronic devices. The multi-modal approach of the iDrive touch controller, large touchscreen center display, cloud based voice control, and gesture control allow users to interact in the way of their choosing. The seventh incarnation of iDrive has a cutting-edge, fully-digital design and is geared more closely to the driver’s needs by allowing them to tailor the system to their own preferences with customizable widgets of information. This new level of personalization is then stored in the BMW cloud and can follow the customer to other BMW vehicles. Information from categories such as driving, entertainment, navigation, connectivity, and from the vehicle info itself, can be selected in nearly any combination in any of four layouts on the Center Display. Multiple pages can be created and easily accessed with a simple swipe across the screen with a finger. To maximize the capabilities of the large 12.3” digital instrument cluster, the traditional circular gauges have evolved into an new design that pushes the digital speedometer and tachometer gauges to the outer edges of the display as geometric bands. This new design opens space in the middle for routing and navigation. Information from the center display can also be shown within the tachometer. The drive mode selected via the Driver Experience Control also effects the appearance of the instrument cluster. Other elements of the BMW Live Cockpit Professional are the Navigation Professional system, a hard-drive-based multimedia system with 20 GB of memory and six USB ports, plus Bluetooth interfaces. The driver can be automatically detected and personal settings activated either using the traditional vehicle key or by downloading the driver’s personal settings from the BMW Cloud. Drivers can enjoy the full benefits of the car’s intelligent connectivity capabilities through vehicle apps such as news, weather, office and online search. Other capabilities include Intelligent Emergency Call – which automatically summons swift assistance in an emergency – and regular updates for the navigation system’s maps. A collection of bundled digital services will be offered for the new BMW X7 as the Connected Package Professional. The Connected Package Professional provides Remote Services, Concierge Services, On-Street Parking Information, and Real Time Traffic Information for the first 4 years of ownership. This package allows easy integration and adaptation of new technology over time. Customers can continue to download various new digital services individually as they become available or renew existing services via the ConnectedDrive Store. BMW Connected is the companion app for BMW drivers. Intelligent connectivity helps users to reach their destination easily and with minimal stress – and not only when in their car; BMW Connected is an all-embracing concept designed to seamlessly connect the driver and their smartphone with their vehicle. At the heart of it all is the Open Mobility Cloud, which allows the app to connect the car with the customer’s digital devices. These could include the iPhone and Apple Watch, smartphones and smartwatches running the Android operating system, Alexa-compatible smart devices and Google Home. For instance, the BMW Connected app can import appointments and addresses from the customer’s calendar entries straight into the navigation system to begin route guidance. The system calculates the optimum departure time based on real-time traffic information and notifies the driver with a message on their smartphone when it is time to leave. As the vehicle is linked up via the Open Mobility Cloud, it is able to access the calculated route directly when the navigation system starts up. The standard audio system in the BMW X7 xDrive40i features 10 speakers and 205 watts of power. A Harman Kardon Surround Sound Audio is standard in the X7 xDrive50i, optional on the X7 xDrive40i. Wireless Charging and WiFi Hotspot are standard for both models to integrate your favorite personal mobile devices into the BMW X7 experience. The Bowers & Wilkins Diamond Surround Sound is available as an option for both X7 models offers amplification of 1,500 watts, powering 20 speakers. The optional Rear-seat Entertainment Professional system adds a pair of 10.2-inch full-HD touchscreen displays, a Blu-ray-compatible DVD player and an HDMI socket and two headphone jacks. The system works using the BMW iDrive 7 display and control system, and so allows those in the rear of the vehicle to select and operate entertainment functions. The rear-seat passengers can use both their own media sources and those available in the front compartment. A navigation map and BMW ConnectedDrive services can also be accessed in the rear seats. Adaptive LED headlights with BMW Laserlight. The BMW Head-Up Display, optional for the xDrive40i and standard on the xDrive50i, helps the driver to enjoy focused and extremely safe driving in the new BMW X7. It projects driving-related information directly into the driver’s field of vision on the windshield, where it can be assimilated without the need to divert their eyes from the road. The latest generation of the system boasts a larger projection area then that of past systems plus enhanced graphics and additional display readings. The information projected by the BMW Head-Up Display includes the car’s speed, speed limits and overtaking restrictions, Check Control messages, status indicators and warnings from the assistance systems, detailed route guidance and turn instructions, and telephone and entertainment lists. Another feature activated in conjunction with the BMW Head-Up Display is distance warning, which is part of the Active Cruise Control system’s set of functions and flashes a graphic icon to alert the driver when they get closer to the vehicle in front than the pre-set minimum distance. Making its debut in the new BMW 3 Series Sedan is the BMW Intelligent Personal Assistant, an intelligent, digital character that responds to the prompt “Hey BMW”. The BMW Group is set to revolutionize driving pleasure with the BMW Intelligent Personal Assistant and, in so doing, enter a new era in which drivers will increasingly be able to operate their car and access its functions and information simply by speaking. The range of functions and skills available will be constantly expanded as part of regular updates. The BMW Intelligent Personal Assistant learns routines and habits, and is subsequently able to apply them in the appropriate context. He helps the driver, learns their preferences and is familiar with their favored settings – e.g. for the seat heating or the places they drive to frequently using the navigation system (“Take me home”). It is familiar with the vehicle’s functions and is able to operate them as required. Saying “Hey BMW, I’m cold” will prompt the BMW Intelligent Personal Assistant to adjust the temperature inside the car accordingly. The assistant will benefit from technical upgrades and be able to learn more and more preferences and favored settings. The assistant takes further strides forward with every command given, every question asked and every setting selected. The arrival of the BMW Intelligent Personal Assistant ensures there is always a genuine BMW professional on board. He is able to explain all sorts of different functions (“How does the High Beam Assistant work?”), provide current status information (“Is the oil level okay?”) and help answer questions (“What warning messages do I have?”). He knows the driver’s favorite settings, and can even activate a combination of them to enhance well-being. For instance, “Hey BMW, I feel tired” triggers a vitality program that adjusts the lighting mood, music and temperature, among other things, in order to make the driver feel more awake. The Intelligent Personal Assistant is, in short, the ideal co-driver and comes in particularly useful during everyday driving (“Hey BMW, what is the closest gas station on my route”). To make navigation particularly easy, drivers can give him access to their calendar and contacts, which will enable him to find parking spaces at the destination, provide information on traffic jams along the route and remind the driver when they need to set off. It also learns destinations the customer drives to frequently. The BMW Digital Key employs Near Field Communication (NFC) technology to allow the new BMW X7 to be locked and unlocked from a compatible smartphone, removing the need for a conventional car key. Holding the smartphone up to the door handle opens the car. Once inside, the engine can be started as soon as the phone has been placed in the wireless charging or smartphone tray. Accessible via the BMW Connected app, the Digital Key offers unrivalled flexibility. The BMW Digital Key is compatible for all NFC-capable Samsung Galaxy smartphones running Android 8.0 and above. Compatibility is limited to select carriers. The Remote Software Upgrade feature keeps the vehicle up to date with the latest software. All updates can be loaded over the air, similar to smartphones. The upgrades can be loaded onto a smartphone via the BMW Connected app when connected to a domestic Wi-Fi network or imported directly via the BMW’s built-in SIM card, which happens automatically for important vehicle upgrades. This is a vehicle they need, they have to have a big 3 row SUV, especially for the American market. Not sure about the grille, but I like the profile and rear, and the interior. So Cadillac . . . . where is the XT7 to combat this one and the GLS-class? I have to say the interior of this looks top notch. I saw some photos of the beige and blue interior and that looked quite good. The pricing is quite good too, BMW came to play here, gauntlet thrown, we'll see how Mercedes responds with the 2020 GLS. Odd...I like this vehicle but still prefer both the Escalade and Navigator strongly to this. Everybody keep your cheat sheets handy! I like it a lot better than the Benz or Audi equivs. It has almost as much presence as a Navigator. The grill is a bit much, but overall I like this way better than the MB or Audio options. Interior is very nice. I have to say I love the sky roof for all 3 rows. that is awesome. Now two german SUVs that I like, the EQC and this. X5 looks way better to me. It's nothing major just a bunch of small tweaks that make it look better to me. The difference will be in the size of the sausage. Agree, they need to have a Monochromatic option or at least a Black Chrome option for those that do not like the Baby Boomer Bling look. I thought a Bratwurst was a Bratwurst regardless of size! I think that might be it. The proportions just seem a tad off everywhere on the X7 compared to the X5. Granted, I've always though the X5 was one of the best proportioned and designed SUVs so there's that. It has longer rear doors and rear quarters are than the X5, with a thicker, more upright D-pillar..more formal than the sportier X5. Looks handsome to me. Sorry for the tagging. Testing something and accidently posted and I couldn't delete, only edit. Maybe the longer, narrower grilles would have worked better on the X7..something inspired by this face, perhaps? Is that the Kim Kardashian version? I swear it looks like someone rear ended her! Benz will have a strong response and the GLS is supposed to get a Maybach trim. And we know the GLS63 will have 603 hp, they trademarked GLS73 for something above that. So I imagine BMW will have to do an 600 hp X7 M. Horsepower wars are on! Only they have moved to $90K+ crossovers rather than fast sports sedans (and sports cars).